Congratulations to all Flyers who raced at Regionals over the last two weekends. There were countless pbs, plenty of finalists and tons of grit and determination on show. Flyers grabbed a haul of 6 gold, 11 silver and 12 bronze medals – despite several members of the team being struck down with the lurgy at various points over the course of the two weeks. We also have 8 swimmers hitting qualification times for the Welsh Nationals in Swansea at Easter. These are huge achievements and you should be as proud of them as the club, coaches and parents are. Thank you to all coaches who helped with poolside duties. Without your commitment it wouldn’t happen. Two galas in a couple of weeks saw seven Flyers make a splash in Llanelli and Cardiff. Alexa, Victoria, Sammy and Zac stormed the Llanelli Open, grabbing 9 medals and a clutch of fresh PBs. Alexa set the tempo, with a storming swim in the 100m breaststroke to hit the wall in 1:38.38, claiming a well deserved silver medal. The young Flyer also slashed more than 15 seconds off her 200 freestyle (2:54.11) and her 200 IM, touching in 3:20.43. Victoria left Llanelli with an impressive haul of medals, claiming three bronze and two silver. She took second spot in the 50m breaststroke in a time of 51.75 and also grabbed second in the 100 IM, slicing 1 second off her previous best time to touch in 1:37.29. Sammy took more than 7 seconds off his 100 freestyle time, setting a fresh high water mark of 1:26.72. He also cut almost 3 seconds off his 100 backstroke, touching in 1:36.48. Zac bagged three silver medals in 100 breaststroke, 100 fly and 200 IM. He shaved 1 second off his 100 breaststroke to finish in 1:40.02, and nudged his 200 freestyle to a new PB of 2:50.40. Three Flyers braved the icy weather to fly the flag for the ‘black and orange’ at the Tiger Bay Open last weekend. Hans secured silver in the 100 fly and came away with a clutch of ‘speeding tickets’ for beating the meet’s upper cut off times. The pick of his swims include a speedy 3:17.00 in the 200m breaststroke and 2:56.13 in the 200 IM, a 49 second advance on his previous best long course time. Well done to Dafydd and Rhydian for taking to the water in black and orange for their first competition. Dafydd put down a satisfying 1:15.78 in the 100m freestyle, and 1:41.81 in the 100m breaststroke. Rhydian set some brand new targets, with 1:35.20 in the 100m freestyle and 2:16.47 in the 100m breaststroke. Thanks to Rob, Lorraine and Fred for taking on poolside duties. It wouldn’t happen without your input. Well done all. Go Flyers! 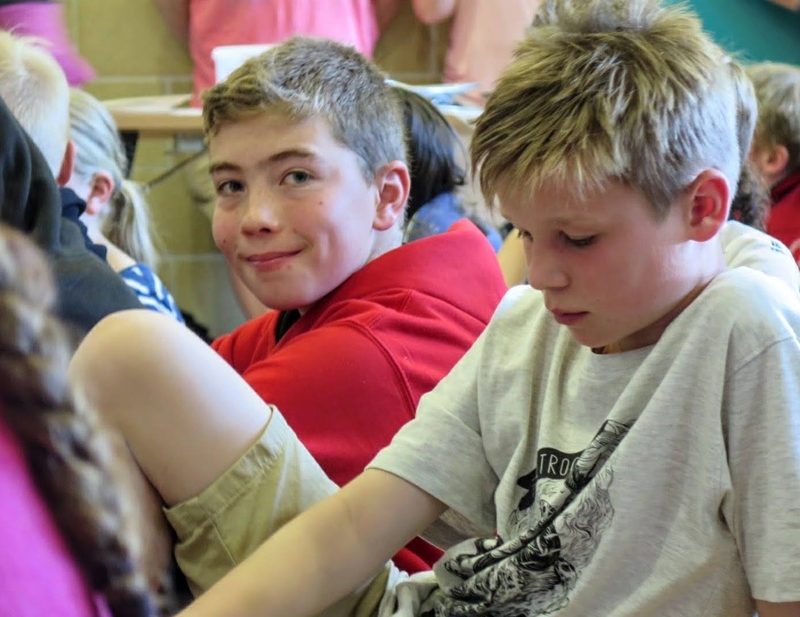 Good luck at the National Finals this weekend in Cardiff to Rhys and Rachael, competing in the secondary schools competition, and to Dexter and Chloe, who are representing their schools and the county in the primary school races. 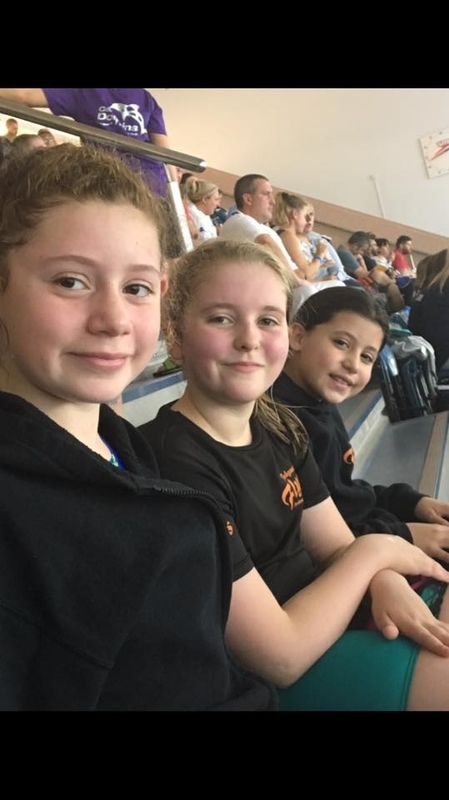 Three Flyers set their sights on this year’s Winter Nationals at the National Pool in Swansea, competing as part of a combined Pembs county team. Rhys Davies, Rachael Lewis and Zac West met the tough qualifying standards to join up with some of the best swimmers in the county to fly the flag for Pembrokeshire over the course of last weekend (1st-3rd December). Rhys produced a cracking swim in the 15-16 year 200 backstroke to grab gold in a time of 2:15.60. He got close to securing another medal in the 100 back, shaving 0.49 seconds off his previous best time, to finish fourth. Rachael qualified for the 50 and 100 breaststroke, and she produced a fine swim to cut 2.5 seconds off her 100 time to hit the wall in 1:24.75. Zac also qualified for two events in his favourite backstroke, slashing almost 7 seconds off his previous best long course 200 backstroke time to touch in 3:04.17. 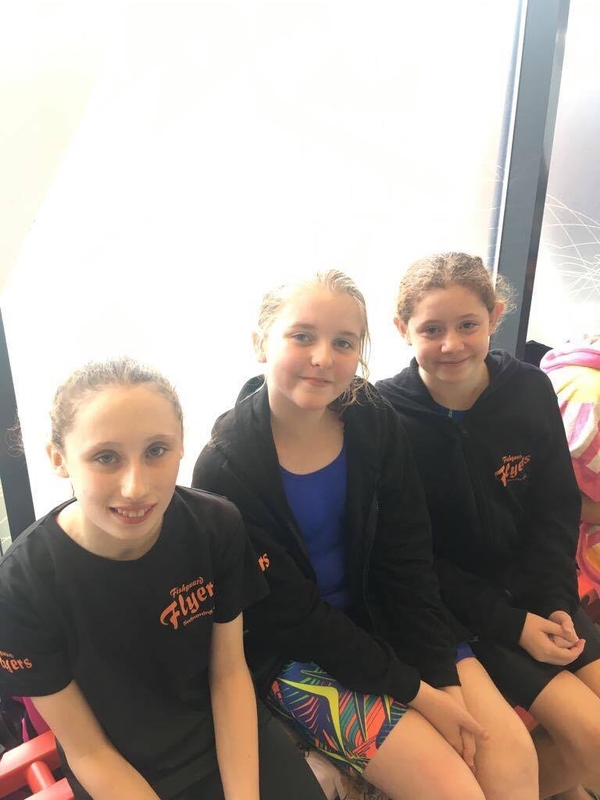 For all three, but particularly our two younger swimmers, the step up in competition at a national level event was a valuable experience and will stand them in good stead for the future. The future’s orange. Go Flyers! Three Flyers got off the blocks at last weekend’s Neath Open, aiming to set new long course targets for the season. Alexa continued her recent form by slashing 22 seconds off her 200 IM time, putting a new mark of 3:25.53 on the board. She backed it up with a near-11 second improvement in the 50 fly to touch in 49.43 seconds. Kayleigh R also powered home in a new personal best LC time for the 200 IM, cutting almost 11 seconds off, to hit the wall in 3:20.96. The young Flyer also sliced 8.5 seconds off her previous best 100 fly time, to finish in 1:38.95. Finally, Victoria set a new 200 IM personal best of 3:47.48, finishing fourth in her age category after cutting 6 seconds off her previous time. She also raced to fourth place in the 50 fly in 48.34, smashing almost 8 seconds off her previous mark. Thanks to Hayley from Haverfordwest Seals for taking our three swimmers under their wing for the weekend. Well done girls. Go Flyers! Go Flyers! We may be small, but we are mighty. This was meant to be our fallow year – shorn of our standard bearer, Carys Thomas, and with so many other Flyers’ hopefuls competing a ‘year up’. Fortunately, our plucky youngsters didn’t get that memo, as they reaped a bumper harvest of medals at the Pembrokeshire County Championships. Five golds, eight silver and eleven bronze medals – plus countless personal bests and a fresh clutch of club records – were just rewards for a weekend of racing against our nearest and dearest club rivals. 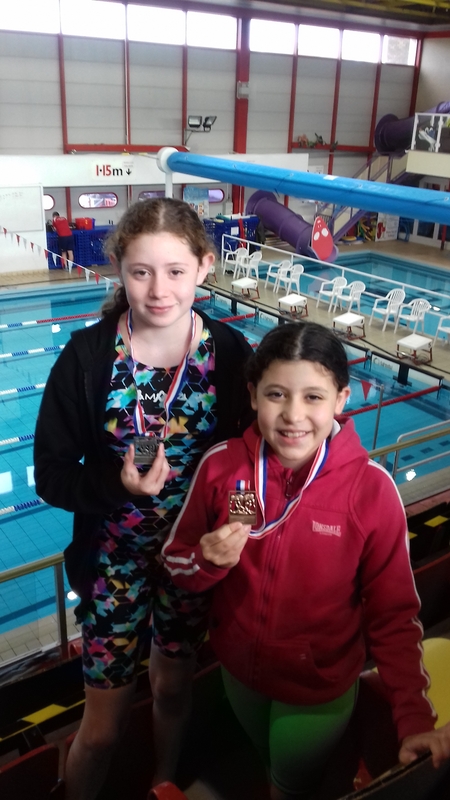 Rachael led the charge for Fishguard, bringing home two gold and two silver medals, including top spot in the 200m breaststroke (aged 11-12) in a time of 3:07.27, plus a flying 50m breaststroke victory time of 39.20 seconds. She secured second in the 400 freestyle and 400 IM. Hats on: Did somebody send Rach the memo about headwear? Ummm…. 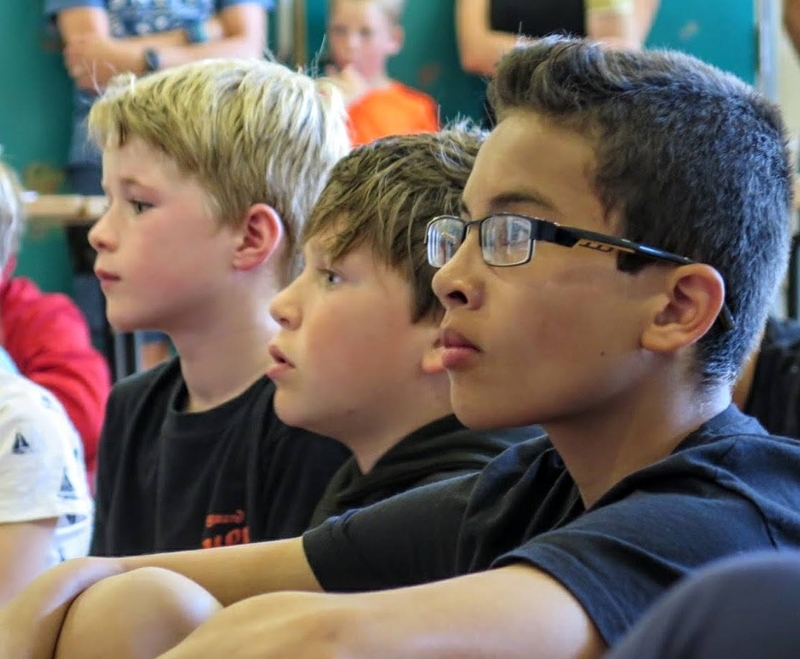 Dexter typified the attitude of the new generation of swimmers coming through the club. The 8-year-old took his first county champs in his stride, claiming a gold and four silver medals. He stormed to gold in the 50m backstroke in a speedy 47.24 seconds, and took silver in the 100 IM in 1:47.87. Kayleigh Fischer bagged gold and two bronze medals, including top spot in the 100 breaststroke (11 to 12 years) in 1:34.97. She also secured third place in the 200 freestyle, hitting the wall in 2:41.82. Rhys Davies completed Flyers’ gold medal haul in the 200m butterfly, touching in 2:30.03. Victoria was one of the many Fishguard swimmers who had to race against rivals a year older, but it didn’t phase the youngster as she still managed to grab silver in the 50 freestyle (9 to 10 years) in a blistering 38.20 seconds. The young Flyer also secured bronze in the 50m backstroke in 43.15. Like Dexter, Chloe shrugged off any nerves from competing at her first county champs to win silver in the 50m breaststroke. The 7-year-old took second spot in a time of 1:05.34. She also performed well in the 50m backstroke, finishing 7th in 57.77. 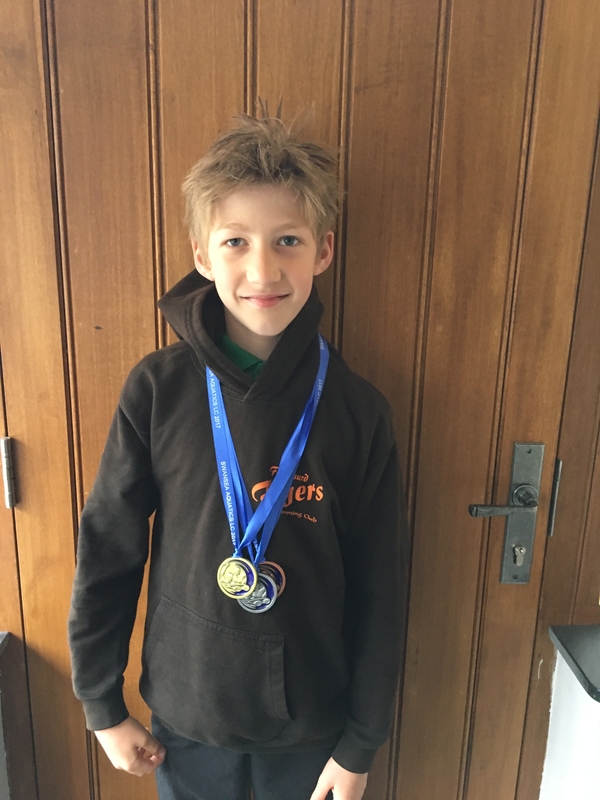 Zac bagged a trio of bronzes (50, 100 and 200m) in his favourite event – backstroke (Zacstroke!). He seized third spot in the 11 to 12 year 200 distance in a storming time of 2:53.89, and notched up a rapid 50m mark of 38.32 seconds. Hans was also rewarded for his hard work in training with three bronze medals, including a first 400 IM time and two powerful displays of breaststroke. He touched in 3:19.87 in the 200m breaststroke, and set a quick fire 1:31.01 for the 100m distance. 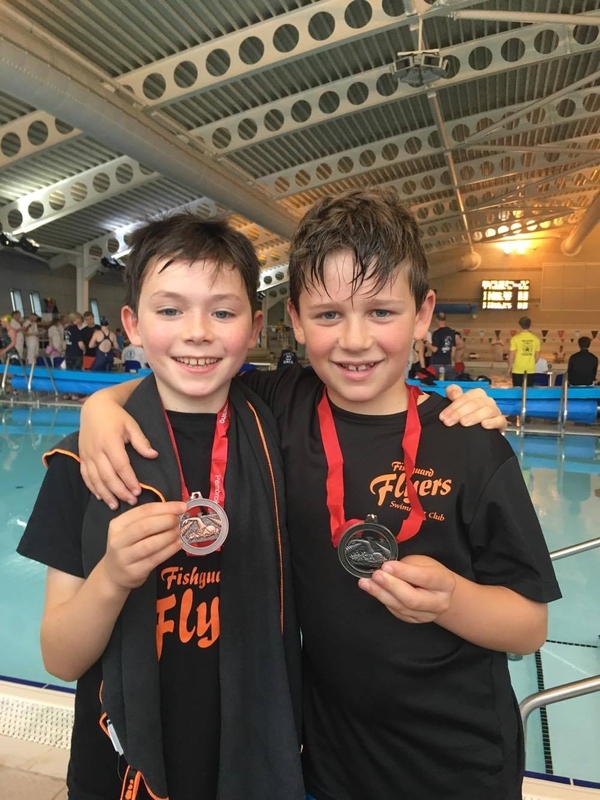 Rhys Caygill rounded off Flyers’ medal haul with two bronze medals in the 50 freestyle, touching in 39.54 seconds, and 50 fly, laying down a 47.78 second marker. Outside the medals, there was plenty to cheer. Rhiannon had a good freestyle weekend, shaving almost 5 seconds off her previous best in the 200 distance to touch in 2:50.55 and notching a new PB in the 100 free of 1:19.33. Kayleigh Reed continued her improvement in the backstroke events, cutting more than 6 seconds off the 200m distance to set a new PB of 3:06.62. She also sliced 5 seconds off her 100m backstroke to hit the wall in 1:25.06. Ella slashed 10 seconds off her previous best 200 IM time, to set a fresh mark of 3:23.75. The young Flyer also carved 1.55 seconds from her 50m butterfly with a rapid 43.52 seconds. Alexa again demonstrated how breaststroke is done – with grace and power – chopping a whopping 37 seconds off her previous 200m time to finish in 3:40.41. She also cut more than 4 seconds off her 100m time to touch in 1:42.11. Kaleb had a strong freestyle weekend, setting his first time for the 200m freestyle of 2:57.98, and slashing 27 seconds off his 100m time to hit the wall in 1:18.88. 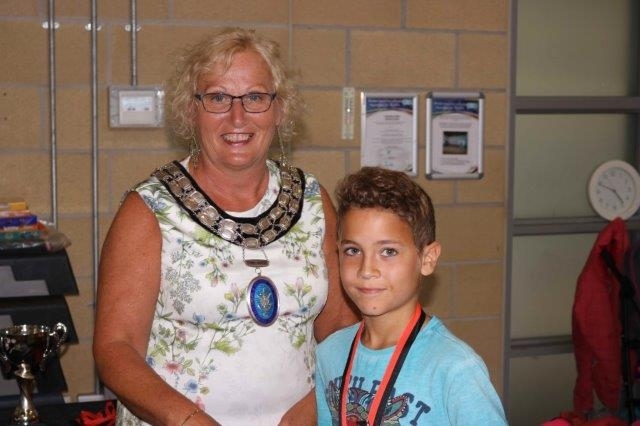 Zachariah clocked up two fifth places – in 50m freestyle in a time of 41.73 seconds, plus 50m backstroke in a rapid 44.04 seconds. Ffion chopped more than 7 seconds off her 50 backstroke time, to lay down a fresh marker of 45.75 seconds. She also took 3 seconds off her 50m breaststroke, finishing in 1:00.74. Patrick cut almost 7 seconds off his 100 breaststroke time, to finish in 1:30.33 (15 and over). He also shaved a bit off his 100 backstroke, hitting the wall in 1:24.23. Sammy battled through a sore throat, which threatened to derail his weekend, to put in a strong 100m IM performance of 1:43.10, a 4.3 second improvement. He also cut almost 5 seconds off his 100m backstroke, to touch in 1:39.19. Eva put two new times on the board in the 100m backstroke, finishing in 2:03.34, and 100m freestyle, touching in 2:03.47. James picked up new times for the 50 breaststroke, of 1:03.63, and 50 backstroke, finishing in 53.58. Nina sliced more than 6 seconds off her 100m breaststroke time, hitting the wall in 2:02.27. Sean raced to a time of 1:00.86 in the 50m backstroke, while Hafwen set a mark of 46.37 seconds for the 50m freestyle. Well done to all Flyers who raced for the black and orange. Thanks to all coaches and parents who helped out poolside over the course of a long weekend. Finally, these performances would not be possible without the time, effort and guidance given by Flyers’ coaching staff. Thank you all. Bring on the sub regionals. Go Flyers! The new Mayor of Fishguard and Goodwick, Janet Wyer, was guest of honour at Fishguard Flyers annual club championships. Mayor Wyer’s presence at the gala and awards on Sunday 16th July was especially poignant because she was instrumental in setting up Fishguard Flyers in 1999. The gala was a huge success, with an afternoon of racing followed by a presentation to recognise the achievements of some of our young swimmers. Mayor Wyer shared some memories of how the club had changed since she founded it, adding: “I was thrilled to be asked to come today. Keep up the good work, you are all doing great.” The new mayor also donated two special trophies for the event. The first was for Best Personal Achievement, which was presented to Zachariah Owen, 9. The young Flyer was chosen for his stunning success at this year’s Urdd National Gala in Cardiff, where he grabbed bronze in the final. 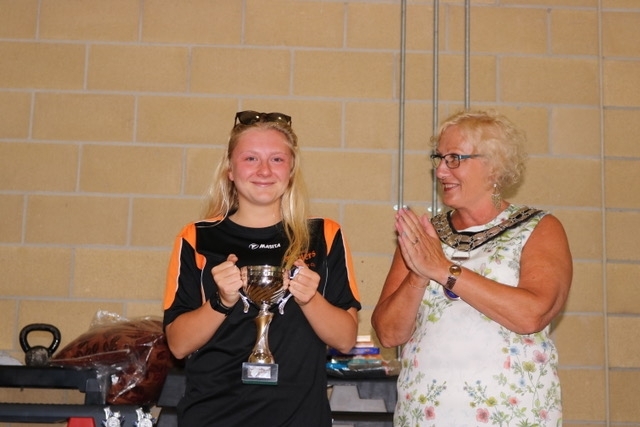 A second trophy – the Fishguard Flyers Wyer Cup, Special Ambassador Award – was handed to 18-year-old Carys Thomas. 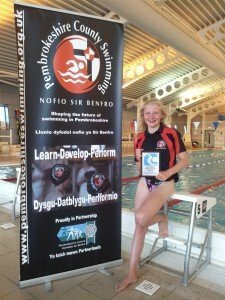 Until recently, Carys was a member of the Pembrokeshire County Swimming performance squad and is looking forward to heading off to university. The Water Dragons Awards were presented to Dexter West, Chloe Thomas, James Stark and Hafwen Rees, recognising improvements among some of the club’s youngest swimmers. 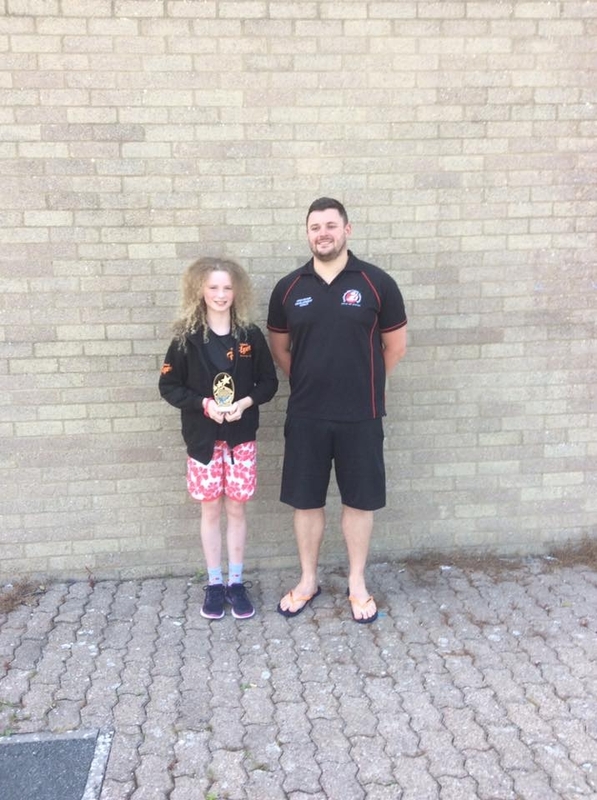 The Coaches Award went to Eva Banks and Gabriel Bingham, and a Best Squad Award was handed to the club’s Development 2 and 3 swimmers. Before the presentation, the gala saw almost 40 Flyers battle to win Pentathlon Awards, which included swimming all four strokes plus an Individual Medley, which incorporates all strokes in one race. The Pentathlon winners were Sammy Montgomery (boys 8 to 10 years); Hans Schmidt (11 to 14 years); Rhys Davies (15+); Victoria Horne (8 to 9 years); Georgie Kovachev (10 years); Kayleigh Reed (11 years); and Rachael Lewis (12 to 13 years). Aside from the prize giving, Fred wowed swimmers and parents alike by unveiling the new ‘Club Records’ board, which details every short course and long course record set by members past and present. A scrum soon ensued as eager eyes perused the impressive board for their names, while setting sights on fresh targets for the coming year. It is hoped the board, and accompanying Club Record Holder swim hats (donated this year by Karl and Lorraine), will give our young team further incentive to want to improve on the already excellent performances seen so far. On a sweltering day at Milford Leisure Centre, a determined young group of Flyers took on their friends and rivals from other Pembrokeshire clubs and came away with a well earned second place in the inaugural Pembs League. 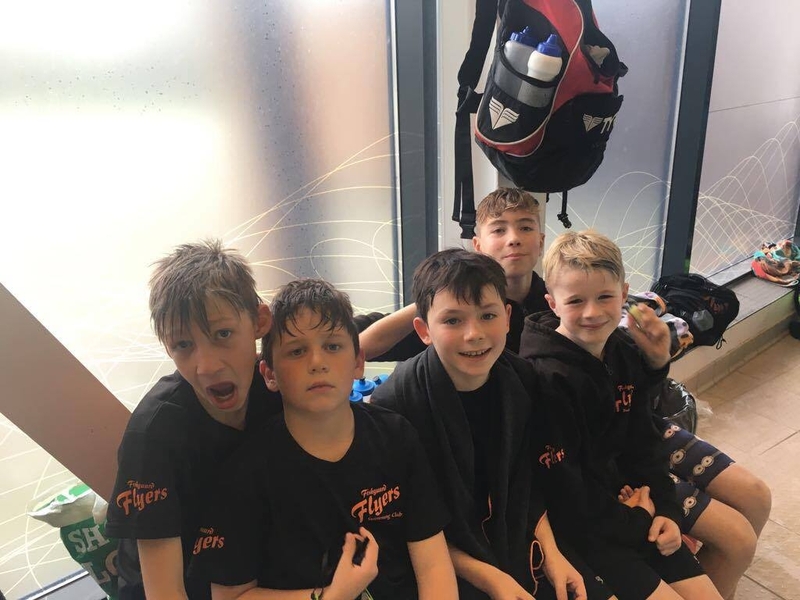 A win in round one against Preseli Panthers, followed by a battling performance in the second round – when we were beaten by Haverfordwest Seals – meant the target for the ‘black and orange’ was to edge out Milford Tigers for second place overall. 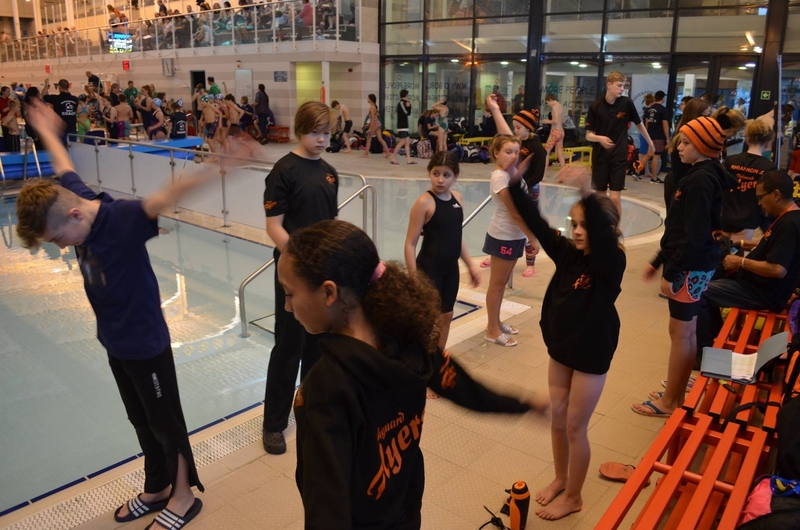 Yet again, there were too many excellent performances to single out, and many Flyers had to ‘swim up’ age groups due to a lack of numbers in some categories. Milford appeared to enjoy their home advantage in early exchanges before Flyers responded with a strong run of first and second places. The race for second spot was well and truly put to rest during the relays, when Flyers touched ahead of the Tigers in every race. 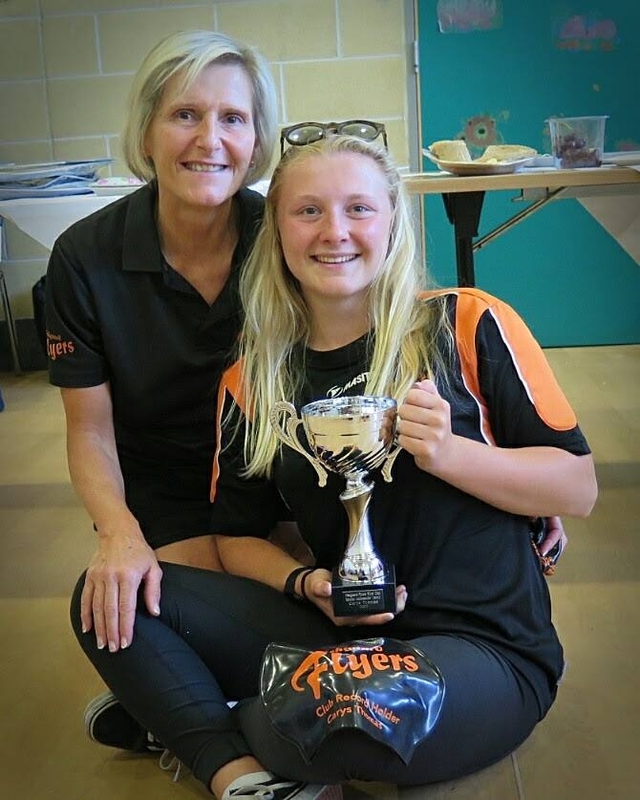 A great achievement for the club was made all the sweeter as Rhiannon Clapham was also awarded the ‘skills award’ for her performance, particularly her strong underwater work. Well done Rhiannon. 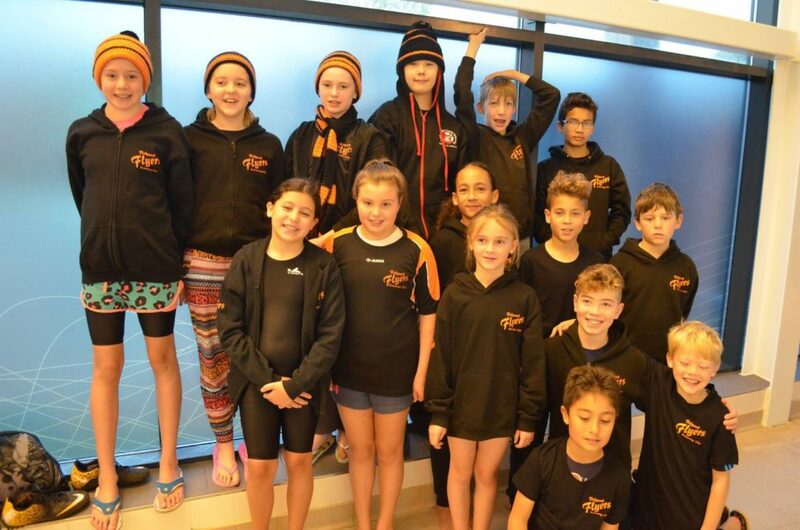 A huge well done to all swimmers who wore the black and orange with pride. Thanks to all the coaches for being poolside. Particular thanks to Sian, who took the lead for Flyers in co-ordinating the event. Finally, congratulations to Haverfordwest Seals on the victory and well done to Milford Tigers and Preseli Panthers. We’ll be back next year. Go Flyers! 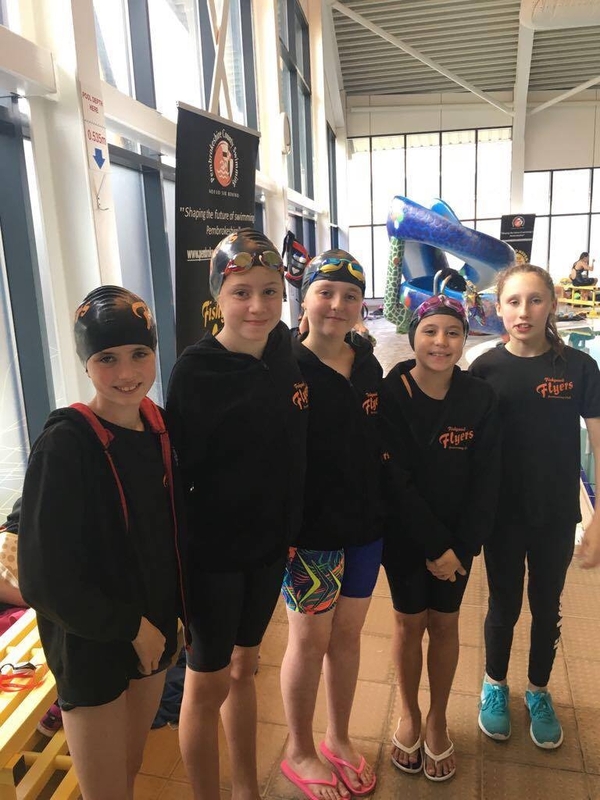 Seven Flyers showcased fine swimming skills to rack up a stack of personal best times at last weekend’s West Wales Junior Development Meet. 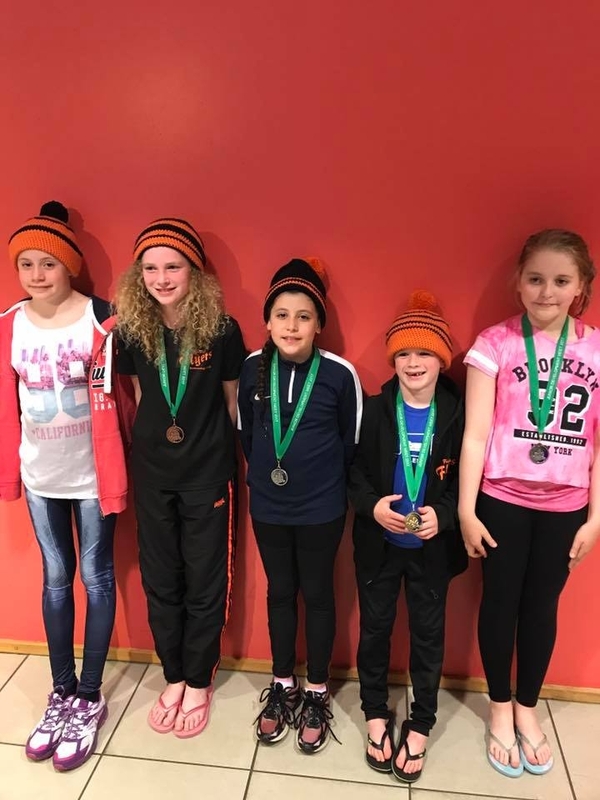 The club’s young competitors (aged 9 to 12) took the National Pool in Swansea by storm, with five of the seven securing a top three finish in the Pentathlon – two gold, two silver and a bronze. 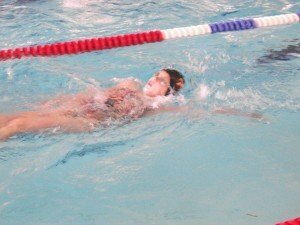 Swimmers were entered in five events – all four main strokes plus an IM – and the combined times of all those races determined the winner of the Pentathlon. It proved to be a good day for the boys, with both Zac and Sammy storming to Pentathlon gold after a string of strong swims. Zac put all the hard work at training into practice, winning all five events, including his first time for the 100m butterfly of 1:36.05 and an 11 second improvement on his 200m IM to touch in 3:09.80. Sammy seized his chance to shine by also winning all five events. The stand out performance for the young Flyer was cutting almost 5 seconds off his previous best for the 100m freestyle to hit the wall in 1:33.98. He also took nearly 3 seconds off his 50m breaststroke to finish in 58.44. Victoria grabbed silver with some powerful swimming, the pick of which was a 6 second improvement on her 100 IM to finish in 1:40.22. She also sliced 3 seconds off her 50m breaststroke to touch in 54.62. Kayleigh Reed continued her good form by grabbing silver. The young Flyer powered to a 7 second improvement in the 200m freestyle to hit the wall in 2:54.34. She also won the backstroke race with a time of 1:30.11, knocking almost 2 seconds off her previous best. 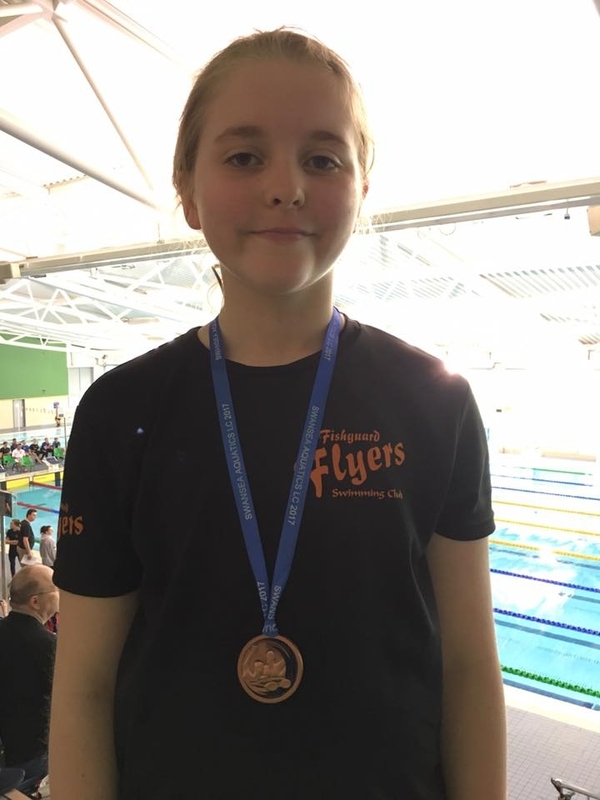 Rhiannon rounded off Flyers medal haul with bronze after some gutsy swims in the more gruelling events. She cut 3 seconds off her 100m butterfly to touch in 1:46.44 and slashed four seconds off her previous time in the 200m freestyle to finish in 2:55.35. Outside the medals, Alexa – who showcased the full range of her elegant strokes – gave a fine account of herself with a near-30 second improvement in the 200m freestyle to touch in 3:09.82, plus almost 7 seconds slashed from the 100m backstroke to finish in 1:37.55. Evan completed 3 of the 5 events, but was forced to end his day early after feeling some muscle strain. 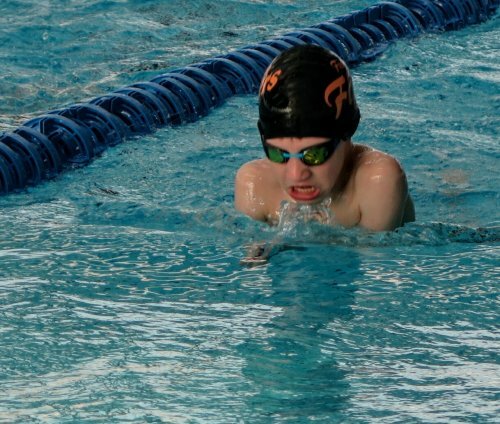 However, he performed admirably before this, speeding to second place in the 100m breaststroke in 1:48.32. He also notched up his first time for the 100m backstroke of 1:38.38. On an incredibly hot day in Swansea, it was great to see our young bunch racing for some medals and being fine ambassadors for the club. Thanks to Kath for offering encouragement and advice on poolside. 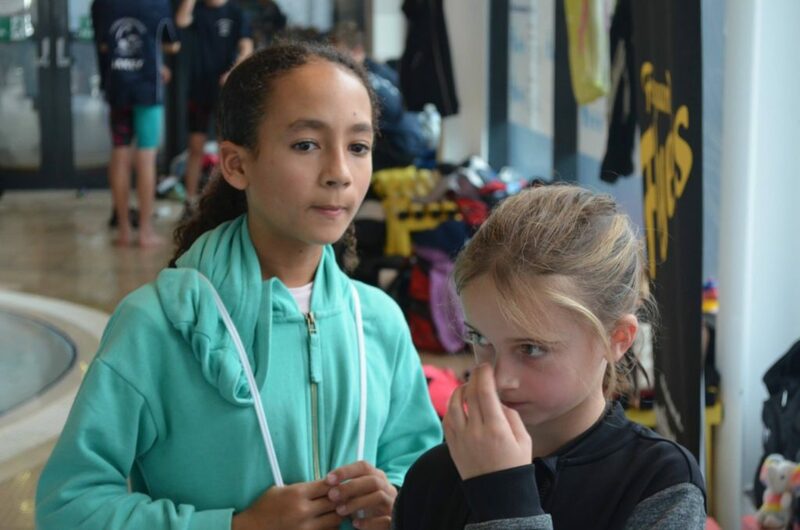 Well done to all swimmers and parents for supporting each other and behaving in a manner that can only enhance the club’s reputation. 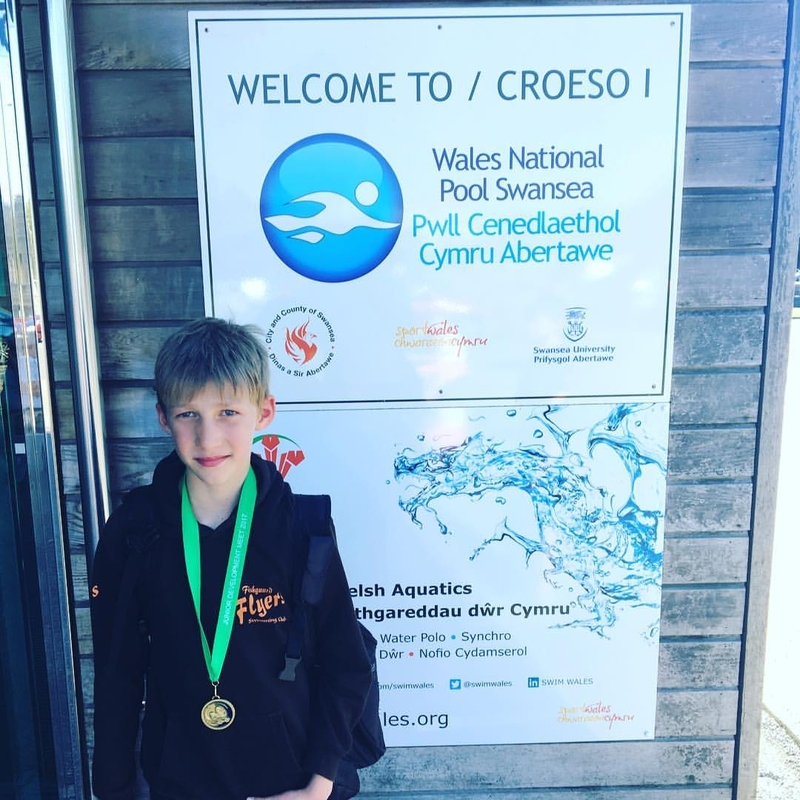 Two young Flyers did the club proud at the Swansea Aquatics Long Course meet at the National Pool over the weekend to showcase fine skills and some gutsy performances. This level 1 long course (50m pool) meet required fast times to enter and it attracted clubs from across Wales, England and even one from Ireland. But Kayleigh Reed and Zac were unfazed by the step up in quality and stormed to a series of finals to claim four medals. Kayleigh was first to make her mark, continuing her excellent form in the 50m butterfly. The young Flyer seized a bronze medal in a blistering time of 40.04 seconds, cutting almost 4 seconds off her previous best. In a strong field of girls, Kayleigh came sixth in the 50 freestyle ‘splash and dash’ in a time of 36.07 seconds. She followed this up with fine performances in the 200 and 100 free – cutting almost 5 seconds off her 200 time to finish in 3:00.60. Kayleigh reached the final of the 100 free after posting a preliminary time of 1:19.53 but was unable to improve on that in the final. This talented young Flyer rounded off an exhausting weekend of competition with a 43.76 second finish in the 50 backstroke. Zac seized his chance to shine on the big stage by grabbing gold, silver and bronze, plus two fourth places. He qualified for the 100 freestyle final, moving from fifth after the preliminaries to claim fourth in the final, in a time of 1:22.39. Zac also placed fourth in the 100 breaststroke, being touched out by a finger length, in a time of 1:48.02. The 200 IM saw Zac produce a fine swim in the heat to qualify for the final in a speedy 3:15.36, dropping almost two seconds off his previous best. He was unable to improve on that mark in the final, but still claimed a bronze medal. Zac also seized silver in the 200m breaststroke to hit the wall in 3:46.96. However, the young Flyer left his best ’til last. After qualifying for the final of the 100 backstroke in second spot, in a time of 1:30.44, he set his sights on gold. A blistering final saw Zac overhaul his Neath rival to grab top spot in a staggering 1:26.32 – dropping almost four seconds from his heat time. 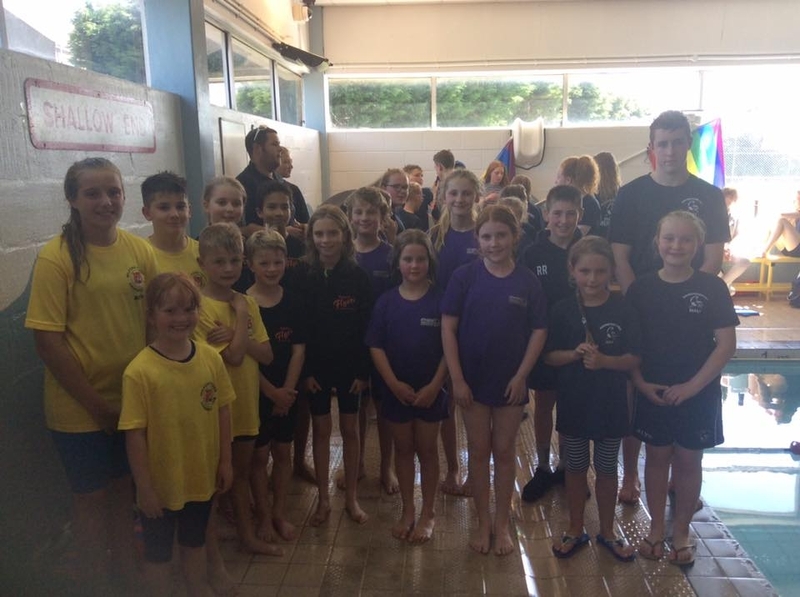 Well done to Kayleigh and Zac, and to all the other Pembs County swimmers, including our own Rachael Lewis. Thanks to Lorraine for being poolside for the club. Thanks also to Craig, Ceri and David from Pembs County Swimming for taking our fledgling Flyers under their wing in the warm ups and for the constructive feedback.